Citrix application monitoring is the perfect solution to ensure virtualization doesn’t slow down application performance. Make sure end users are getting the best quality of experience on Citrix-delivered applications and virtual desktops. Check the entire virtualization environment – network, client side, server side – with ip-label’s Citrix application performance monitoring tools. Citrix-delivered applications must be monitored proactively on the client side, from the vantage point of the XenApp or XenDesktop user, to ensure optimum performance for remote users. By monitoring the Citrix end-user experience, you can spot weaknesses in the overall environment. To track how well Citrix applications or virtual desktops are performing for end users, a Newtest robot is installed on the client side to simulate typical user transactions repeatedly, around the clock. It returns an extensive variety of indicators, and can measure as far as each click within the application interface. This type of synthetic monitoring operates even when no real users are logged on, so it can issue alerts any time it detects problems. The robot can provide screenshots when errors occur during simulated user transactions; this way you can see exactly when and under what circumstances an issue arose. The reporting feature supplies objective metrics which can also be used to keep track of service level agreement commitments. Users of Citrix applications may experience bottlenecks or unavailability whenever issues arise upstream, whatever their cause. 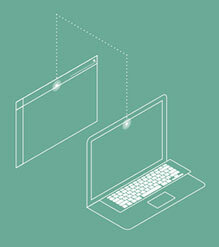 It is up to IT staff to find out what the issues are, identify the causes, and troubleshoot them efficiently. For this, IT teams need to be able to scrutinize the app itself and check up on the network. Server-side application monitoring distinguishes between the performance of the application itself and the latencies that may be caused by the Citrix layer. To do so, a Datapm agent is installed on the Citrix infrastructure server and on the application server(s). It provides performance indicators from the Citrix platform, as well as transaction metrics from the application server, including stack trace, SQL requests, and code-level details for troubleshooting. The Datapm console provides mapping to visualize the relationships, for example, between a XenApp server and Microsoft SQL databases, WebSphere server, and other roles. 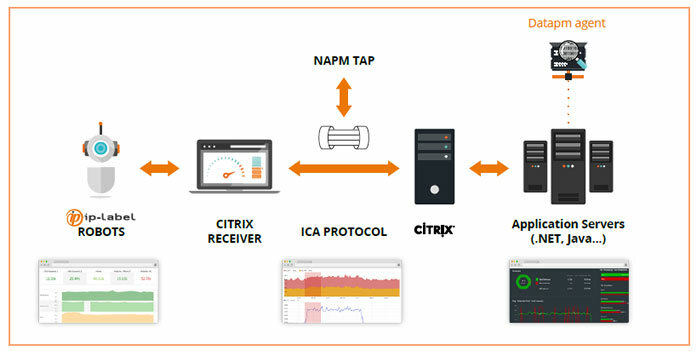 For insights into network application performance, monitoring can be implemented by a tap situated on the network between the Citrix server and the Citrix Receiver or as a virtual agent on a VMware server. This non-intrusive approach analyzes how the network is performing for connected users. It yields different kinds of low-level, TCP/IP network metrics, in addition to end-user metrics about Citrix session times from the ICA protocol. Remote users of Citrix-delivered applications may experience sluggish performance. This is not due to technical glitches in the application or network, but rather to capacity. This is why load testing critical Citrix applications is simply good practice before going live. Citrix performance testing with the Datalimit solution runs transactions which simulate user activity to determine how the system behaves under load. The script – which performs such operations as checking for a Citrix application window, finding images and texts, and inputting keystrokes or mouseclicks – is deployed to a fleet of servers (virtualized or in the cloud) on which Citrix Receiver has been installed. The results of such testing, summarized in a report, provide key information for capacity planning and optimal sizing and configuration of all the elements in the Citrix architecture. It is an essential component for ensuring a good user experience of applications and/or virtual desktops delivered on a Citrix platform (XenApp/XenDesktop)… and an ideal source of facts and figures for justifying IT investment.